The Mooney Acclaim Type S is a single engine airplane that is built by Mooney International Corp in Kerrville, Texas USA. The aircraft is also built in Kerrville and then shipped to China to be assembled by Henan Soaring Aviation Corp in Zhengzhou, Henan, China for customers in Asia / China. The airplane was originally called the Mooney Acclaim by the company before performance upgrades were made that brought forth the "Type S" name. The Mooney Acclaim was officially launched by Mooney Aircraft Company at Sun-n-Fun April 2006 in Lakeland, Florida. Mooney gained a type certificate from the Federal Aviation Administration (FAA) on October 15th, 2006 for the aircraft. The aircraft replaced the Mooney Bravo in Mooney's aircraft lineup. The Acclaim was built upon the Bravo's performance and the aircraft increased the performance bar for Mooney airplanes. The aircraft was a continuation of the M20 series aircraft that Mooney produced. The Acclaim has a similar airframe as the Mooney Ovation 2 / Ovation 3 (M20R) airplanes. The Mooney Acclaim became one of the fastest single engine airplanes at the time, with a cruise speed of 232 to 235 knots at 25,000 feet. The speed of the Mooney Acclaim matched the speed of the Columbia 400, which today is the Cessna TTx. The aircraft originally sold for a list price of $495,000 USD (without options). In October 2008, Mooney launched the Mooney Acclaim Type S, a Mooney Acclaim with aerodynamic performance modifications. By improving the Hartzell propeller and creating other performance modifications, Mooney was able to make the Acclaim the fastest production single engine airplane ever built. The new Acclaim Type S hit a new speed record of 242 knots at 25,000 feet, making it the fastest in-production single engine piston airplane. At 16,000 feet the aircraft can achieve speeds of 220 knots. The Mooney Acclaim Type S was originally offered by Mooney in 2008 at a price of $599,500. The aircraft was sold along side the Mooney Acclaim and original Acclaim aircraft could be upgraded to Type S status / performance. Above Photo of a Mooney Acclaim by Robert Frola on Wikimedia Commons. Photo released under the GNU Free Documentation License, Version 1.2. In November 2008 the Mooney Aircraft Company stopped production of all aircraft, including the Mooney Acclaim & the Acclaim Type S. Due to the U.S. financial collapse of 2008 / 2009 the company was unable to continue production. Before production was ended, Mooney had produced well over 112 Acclaim airplanes. In October 2013 the Mooney Aircraft Company was acquired by Soaring America Corporation. Soaring America is a USA based subsidiary / is related to Henan Meijing Group Co Ltd or Meijing Group. Meijing Group is a Chinese based real estate / property management company. Meijing Group is the new primary owner of Mooney. A new company, Mooney International Corp, was set up to take over all the operations of Mooney Aircraft Company. On February 7th, 2014 Mooney International announced that production of the Mooney Acclaim Type S would be restarted and the production line would be started on February 26th, 2014. The company did not announce if the regular Mooney Acclaim would be available. Mooney International auctioned off the first aircraft off the line, an Acclaim Type S, with all proceeds going to the new Mooney History Museum. The aircraft was delivered to the winning bidder at EAA Airventure (Oshkosh) 2014. The new Mooney International Corp is committed to selling aircraft in China as evidenced by the company's actions. The CEO of Mooney, Jerry Chen, said the following regarding China, "China is an important market for us," says Chen. "After years of strict military control, the country is getting serious about permitting private flights within its borders." In 2014 China announced that they would allow general aviation flights in its airspace. The new Mooney International has a new office location in Chino, CA where Soaring America is located. Mooney International has also set up an office in Beijing, China and on September 29th, 2014 the company announced that Reignwood Group and Xinzhichen Trading had ordered 35 Mooney Acclaim Type S airplanes. All of these orders will be sent to Henan Soaring Aviation Corp in Zhengzhou, Henan, China to be assembled. The aircraft is built / flight tested in Kerrville, Texas and then packaged and shipped in a shipping container to be reassembled in China. Henan Soaring Aviation Corp is likely linked to Soaring America Corp which is linked to Mooney International Corp. Mooney also gained 10 orders at the 2014 EAA Airventure Oshkosh. Eight orders are from customers in the United States. With these new orders, Mooney International has brought the Mooney Acclaim Type S back in production and has brought the Acclaim to a new market. The Mooney Acclaim Type S is known for its performance. The aircraft is powered by the Continental Motors TSIO-550-G series turbo-normalized engine. The piston engine produces 280 brake horsepower (BHP). The Mooney Acclaim Type S has a Hartzell three blade propeller. The Acclaim can seat up to 4 passengers and has a useful load of 1,000 pounds. The interior is small when compared to other general aviation aircraft. The range for the aircraft is impressive with a range of 1,445 nautical miles with the standard fuel tanks and 1,852 nautical miles with the optional fuel tanks. The avionics on-board the Acclaim are powered by the Garmin G1000 avionics suite with a fully integrated autopilot available. Some of the older Acclaim aircraft may not have all the avionic features that the newer Mooney Acclaim Type S has. The official aircraft model name for the aircraft is the Mooney M20TN. M20TN is what the FAA and other agencies officially call the airplane. Full specifications for the plane are located here. 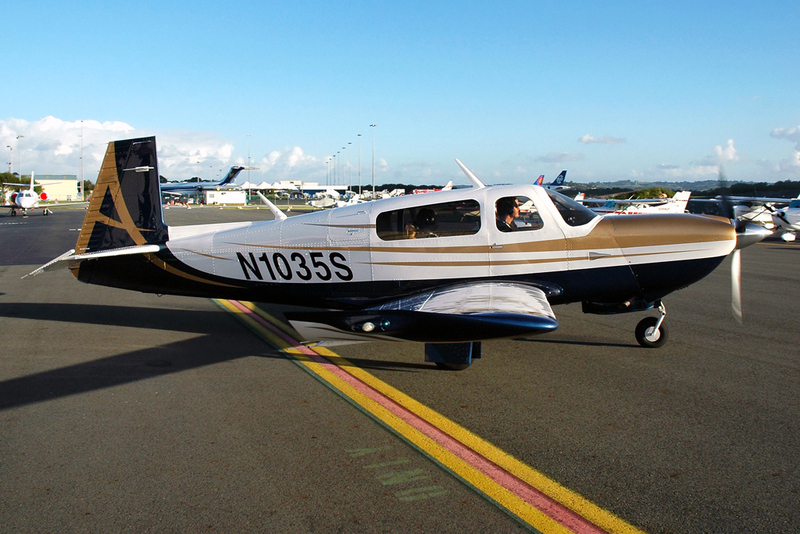 As of January 2015, Mooney is selling the Acclaim Type S for $733,900. This represents a 22.42 percent increase from the original Type S 2008 price. Some media outlets are reporting that Mooney has sold / is selling the airplane for 3 million yuan or $482,100 United States Dollars in China at Henan Soaring Aviation.